His life could change the world. His death could save it. Iowa teens Luke and Tommy are in big trouble at school, not simply because they find their assigned reading boring and say so. Well, maybe the prank they played on the statue of the town’s founding father was part of the problem as well. But they didn’t mean to make trouble; they even volunteered to help save the library’s books when the river overflowed its banks. It was just a lucky coincidence that they found a one-of-a-kind book in the process—a book that someone was offering a big reward to recover. They slip back the library to pick it up and get caught up in not just the flood, but a conspiracy straight out of World War II. It seems that this book contains plans to a time-travel mechanism that will enable some last, lingering Nazis to restore the Third Reich unless Tommy and Luke go back to 1944 to thwart them. Now they’re really in trouble, running from thugs, deciphering the most boring book in the world and trying to save Europe from being overtaken by Adolf Hitler all over again. This volume is hard to put down, with engaging and well-drawn characters, plenty of action and nice side helpings of history. Award-winning North Shore author Falkner (Brainjack) strikes again. This thriller sees Kiwi Luke and his American spy-obssessed friend Tommy taking on Nazi master-criminals after they discover a plot involving the Renaissance genius Da Vinci and the most boring book in the world. Has all the finer attributes of a Dan Brown page-turner but you'll need to read this book to find out why The Da Vinci Code is misnamed. Luke has recently moved from New Zealand to the USA, thanks to his father's new job at the university. He's fitting in okay – almost too well, given that he's already got himself onto the headmaster's radar. But in the process of helping save the town's library from a flood, Luke and his mate, Tommy, find themselves getting into much more serious trouble, all as a result of resucing the most boring book in the world. How can Leonardo's River, a book where the writer takes an entire page to say 'it's cloudy', be so valuable that Luke and Tommy find themselves chased by serious looking German-speaking men with very serious-looking guns? Somehow, Luke and Tommy have to work it out because their English teacher has been kidnapped and only Luke's unusual problem-solving skills lie between her and sudden death. The boys find themselves on a very strange journey – one that involves Leonardo Da Vinci, time travel, and the Third Reich. New Zealand writer, Brian Falkner, already a popular children's writer, exploded onto the science-fiction scene with his breathtaking novels The Tomorrow Code and Brainjack. The Project is another compelling action adventure with a sci-fi twist that will appeal to many teen readers. Falkner celebrates gifted youngsters – teenagers with unusual interests and abilities who find themselves called upon to save the world. He avoids the stereotyping that often weakens narratives of this genre. His adults are complex people driven by their own needs and problems; his teens are reluctant heroes who try the 'ask and adult' route before it becomes evident that the craziness of their new reality makes adult help unlikely. Falkner has a gift for including very believable gadgetry and the detail and conviction of his writing facilitates suspension of disbelief for more sophisticated readers. The combination of action and intellect, forged into a unique, well-crafted narrative peopled with interesting characters make The Project another of Falkner's successes. Miss Sheck is correct when she tries to convince Tommy and Luke that The Last of the Mohicans is not the most boring book in the world. The most boring book in the world, it turns out, is something far more sinister, and far less likely to be assigned for Year 8 English. But when the only existing copy of this book comes into Luke and Tommy’s possession, they find that they’re facing an adventure rather more enthralling than those involved in their usual pranks and mischief-making. The book has the power to change the course of history forever, and for that reason it’s sought after by a group who will stop at nothing to make sure that they, and only they, wield its power. Luke and Tommy find themselves racing against time–quite literally–as they attempt to thwart the nefarious plans of a group of militants who are determined to ensure that their own particular vision of the future is realised. The Project is my first encounter with Brian Falkner, a New Zealand author known for writing quick, clever novels for the male YA set, and I must say that overall it was an enjoyable one. Like authors such as Rick Riordan, Michael Scott, and Michael Pryor, Falkner is perfectly in tune with his audience, the result being a fast-paced novel that manages to offer well-rounded characters, a deliciously zany plot involving conspiracies, time-travel, and Evil! Germans! without the bloat that often typifies the adult versions of such novels. Falkner manages to work in all manner of information about lock-picking and evesdropping, Leonardo da Vinci, steganography, and World War II-era secret societies in a manner that is largely seamless. Even in those points where it does sit a little awkwardly (with a touch of the “as you know, Bob” syndrome, or some overlong Wikipedia searches), Falkner’s characters are written with such warmth and humanity that they stop these sections from feeling dull or unwieldy. Perhaps the weaker elements of the book are the fact that much of the plotting relies on chance and circumstance: the fact that the boys happen across this rare tome at all is a point that needs some major suspension of disbelief, and there are other points where things seem to favour the boys just because rather than out of any real narrative purpose. Characters, for example, seem to be deeply ambivalent at odd times, and frequently bend to the suggestions of the two boys, making me wonder whether perhaps they have extraordinary skills above and beyond their own particular spy attributes. In all, though, this is a quick, pacy novel that offers a clever narrative and some well-written, well-rounded characters it’s impossible not to like. Young readers will snap up The Project, and I must admit that I’d be rather partial to reading through Falkner’s back catalogue myself. Brian Falkner has found his niche with the speculative action genre that has 14-year-old boy enthusiastically hitting their libraries and bookstores. The Project is the third of Falkner's books that will appeal to this readership, and teenagers who enjoyed The Tomorrow Code and Brainjack will not be disappointed with this latest offering. Luke McKay narrates The Project as a high school prank leads him to the discovery of the most boring book in the world, a discovery that unexpectedly throws him into the middle of an adventure that stretches back centuries into the past. Like the characters found in Falkner's previous books, Luke and his best friend Tommy are not typical action heroes, and young readers will be able to relate to their relatively normal personalities. The touch of science-fiction, which seems to creep into a lot of Falkner's work, lifts the book away from straight action, and adds some interesting twists that can be puzzled out as the story progresses. This is the thinking boy's action book with plenty of stunts to keep older readers interested, but without any of the inappropriate subject matter that would shut out a keen younger audience. If anything, The Project is over far too soon, and will continue to prove to teenagers that reading can be just as exciting as a movie or video game. Brian Falkner is a New Zealand writer who has made quite a name for himself in the rather difficult world of young adult fiction for boys, with titles such as The Super Freak, Tomorrow Code and the acclaimed Brainjack. The Project was my first encounter with Falkner and after finishing it in the (these days) short space of three days I can see why he has done so well. The Project is an enormously appealing helter skelter ride through a well constructed plot. Tommy and Luke get caught up in a fiendish plot by fiendish fiends when they inadvertently discover The Most Boring Book in the World. I don’t want to give too much away but needless to say Nazis are involved. Secret Nazi societies! Brilliant! This is action with a capital A. The great thing about The Project is it does not stop. There is no potential for boredom here (despite it being about The Most Boring Book in the World) – boys and girls, young adult and old adult will be enthralled from beginning to end, which is somewhat fortuitous as the plot does require some major suspension of disbelief. Fortunately you’re too busy reading to stop and question some of the serious plot points. I did get slightly irritated with the repetition of a sort of “reading is so boring” meta-theme in Luke’s narrative (Young people think reading is boring! 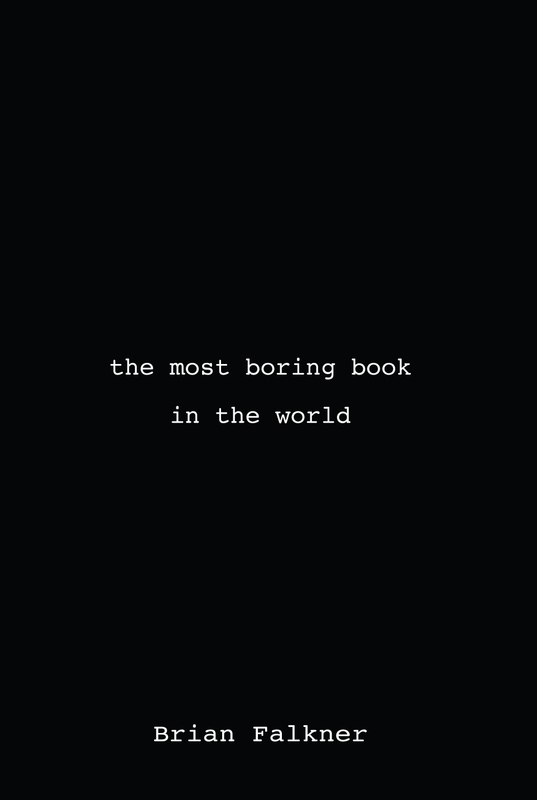 But it’s not boring because you’re reading this non-boring book!) but, meh. How can I quibble with such enthusiasm? Humourously, The Project also contains a short passage from The Most Boring Book in the World. It’s hilarious and unbelievably boring. I’m surprised Falkner could concentrate long enough to finish writing it. He deserves congratulations for that alone. The Project is a must-have to add to your Santa list for good boys and girls and even bad boys and girls. And when they’re done you can nab it for a great summer read.